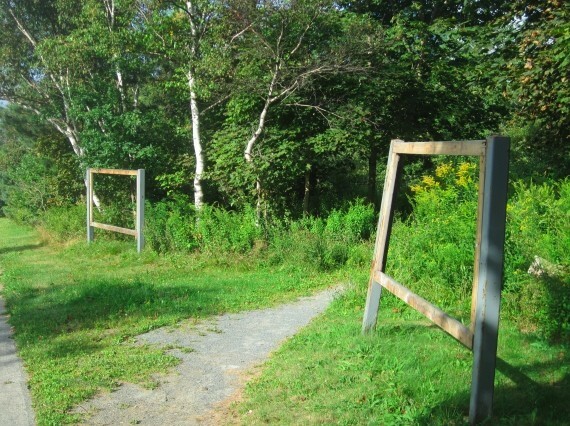 The signs announcing Dartmouth's Urban Wilderness Park were taken down Friday, evidently in preparation for its bulldozing, which ought start towards the end of next month. People in the community have varying opinions about the lost of the park. I guess, in the end, I've come down in favour of its removal to make room for the expanded Bridge Terminal, but that comes with great ambivalence: it really is too bad that the wilderness park hasn't been cared for and maintained properly. And even in its degraded state, it has provided a needed green spot in what would otherwise be a sea of concrete. And yes, the park has been a hang out spot for kids smoking pot. I don't find that particularly offensive---as a teenager, I also smoked pot in the woods next to my high school, and look how great I turned out. I've passed pot-smoking kids in the park many times, and they've been nothing but courteous, if a little embarrassed. But as if to underscore critics' disdain for the place, I walked through Saturday afternoon and found a sprawling older man passed out on the ground, a bottle of Jim Beam next to him. This was sad, mostly, and certainly not dangerous. Once the woods are cleared, he'll just go somewhere else. I hope to soon walk through the woods with a naturalist, who will hopefully give a more nuanced view of the place. Stay tuned.